Ashly Sue Winningham, of Eureka, got into a verbal argument with her boyfriend, and she made some comments that have officials concerned. UPDATE: MARION COUNTY, Fla. -- Marion County sheriff's deputies found a missing 24-year-old homeless woman safe. Deputies found Ashly Sue Winningham on Sunday afternoon. Original: MARION COUNTY, Fla. -- Marion County deputies are looking for a missing homeless 24-year-old woman they believe may be in danger. 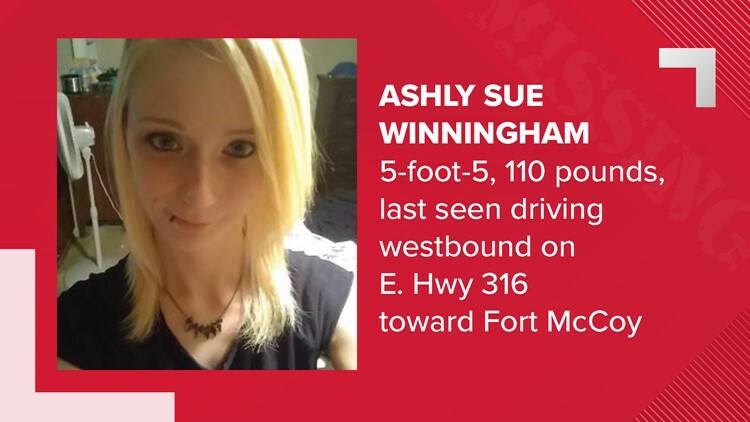 Ashly Sue Winningham, of Eureka, was last seen Friday about 10 p.m. driving towards Fort McCoy on East Highway 316. She got into a verbal argument with her boyfriend, and she made some comments that have officials concerned. She is 5-foot-5, 110 pounds with blue eyes and blonde hair. She was last seen wearing an unknown color hoodie and unknown color shorts.